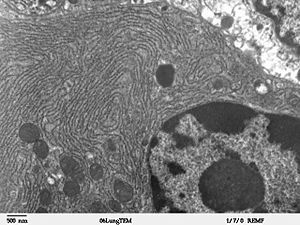 Electron micrograph of rough endoplasmic reticulum network around the nucleus (shown in lower right-hand side of the picture). Dark small circles in the network are mitochondria. Rough endoplasmic reticulum (rER), so called because it is studded with ribosomes, and secretes proteins into the cytoplasm. Smooth endoplasmic reticulum (sER). Among its functions is the production of proteins and steroids, the maintenance of plasma membranes, and a pathway for molecules to move along. Similar to the ER is the sarcoplasmic reticulum (SR) found only in muscle cells. The SR stores and pumps calcium ions. The SR contains large stores of calcium, which it releases when the muscle cell is stimulated. 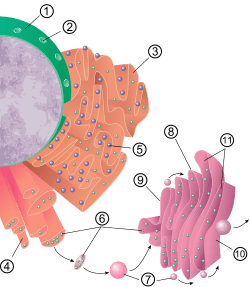 Another type of cytoplasmic network is the plate-like Golgi apparatus. The lacey membranes of the endoplasmic reticulum were first seen in 1945 by scientists using an electron microscope. Endoplasmic reticulum Facts for Kids. Kiddle Encyclopedia.